Chad Van Horn is a bankruptcy and business lawyer and is of Counsel to Weinstein Legal. Chad Van Horn is of counsel with Weinstein Legal, providing guidance and assisting with cases where he can apply his knowledge, resources, and experience. Mr. Van Horn, originally from Pittsburgh, PA, obtained a Bachelor of Science in Business Management from Robert Morris University. After studying abroad at the American University of Rome in Italy, he studied at Nova Southeastern University, Shepard Broad Law Center, and obtained his Juris Doctor. While working toward his law degree, he gained experience in bankruptcy law while working at a law group. In 2009, Mr. Van Horn became a Florida State Bar certified attorney and shortly thereafter founded Van Horn Law Group, P.A. Along with bankruptcy, Mr. Van Horn is proficient in other areas of law, including business and real estate transitions and litigation, loan modifications, and landlord-tenant disputes. Mr. Van Horn is dedicated to giving back to the community as a member of the Board of Directors for Big Brothers Big Sisters of Broward County. 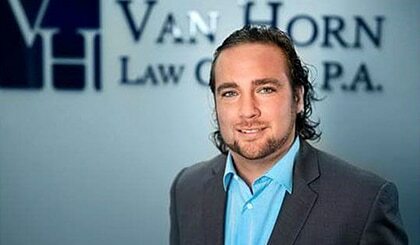 To learn more about Mr. Van Horn’s experience, visit www.vanhornlawgroup.com.